This comic is very hard to review without spoiling anything. I’ll say it right now that I absolutely loved this issue. It’s so fun and crazy that it feels exactly like a comic book should feel. 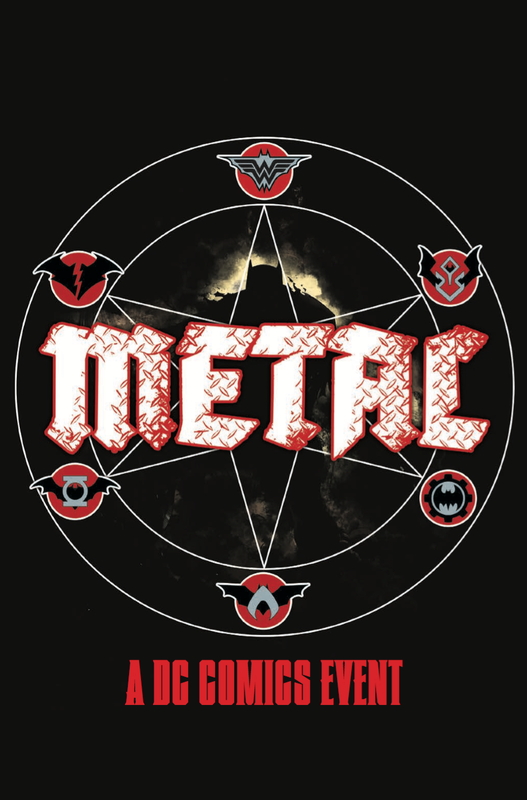 The entire issue is full of great, memorable moments that I don’t want to reveal because I want everyone to go out right now and read it, especially if you’re reading this review before reading the actual comic. 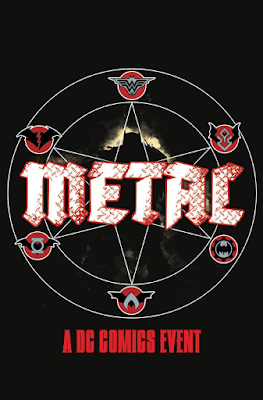 So, if you haven’t read this issue, stop reading this review now and do yourself a favor by reading Metal #1. Then come back and see what I thought. Spoilers ahead. Non-spoiler thoughts after. 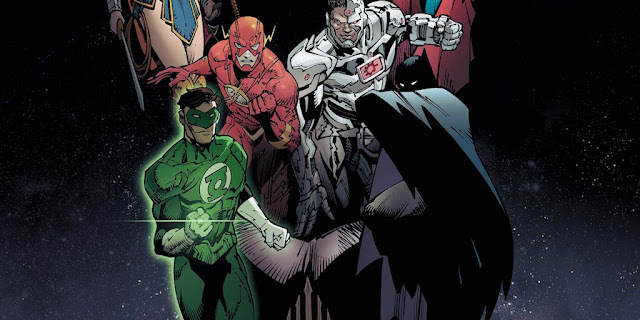 One of my absolute favorite moments is the cold opening where the Justice League is fighting on Mongul’s War Planet (that he presumably got after the events of the “Superman Revenge Squad” arc in Action Comics). What’s really cool here is that Mongul has negated most of the hero’s powers so they can fight fairly. Next, these giant robots that resemble each League member’s colors come to fight them. Before they could be squashed, Batman finds a weakness in the form of a button that has their symbols. The deactivated robots force the heroes inside of them that then allows the heroes to take control of their robot. 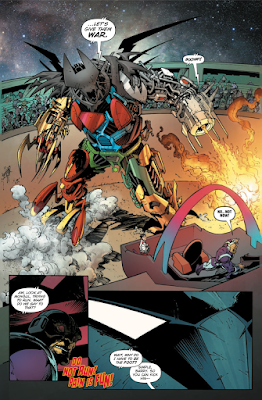 This is where one of the highlights of the issue happens: they form a friggin’ Justice League Megazord to take down Mongul! I was absolutely ecstatic when this happened. I love the Justice League and the Power Rangers and this just made me a happy fanboy. Anyway, the fight is cut short to show the League coming back to Earth. This whole scene has me so curious what happened before and after this. I sure hope we see it because it sounds like a lot of fun to read! Batman knows something huge is coming. Something from the Dark Multiverse. He hopes to stop a full scale invasion of it from occurring. This is what he’s been investigating all this time. Even Doctor Fate is getting premonitions of their invasion, led by the Evil Batmen. I won’t spoil the ending of the issue but this comic was incredible. Dark Knights Metal #1 is a huge book -- it’s history in the making and this issue makes this event feel epic and important. I will even bet the ramifications of this event is going to play into the overall DCU for years to come. 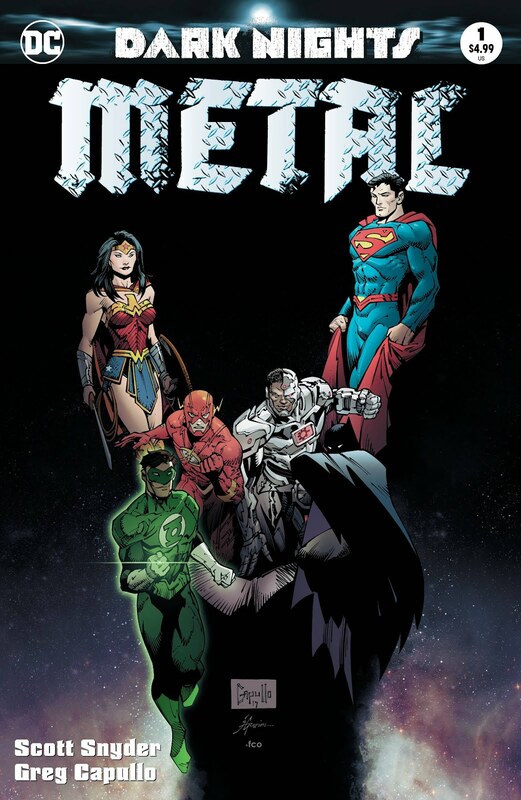 It’s such a fun read and I am glad that DC has allowed Snyder and Capullo to even attempt to write something like this. This is a must for all Batman fans, Justice League fans and DC Comic fans alike.